The HSReplay.net team is proud to announce the release of a much requested feature: Top Legend filter! This new filter will allow Premium users to only see stats from games recorded in the top 1,000 ranks of Legend. 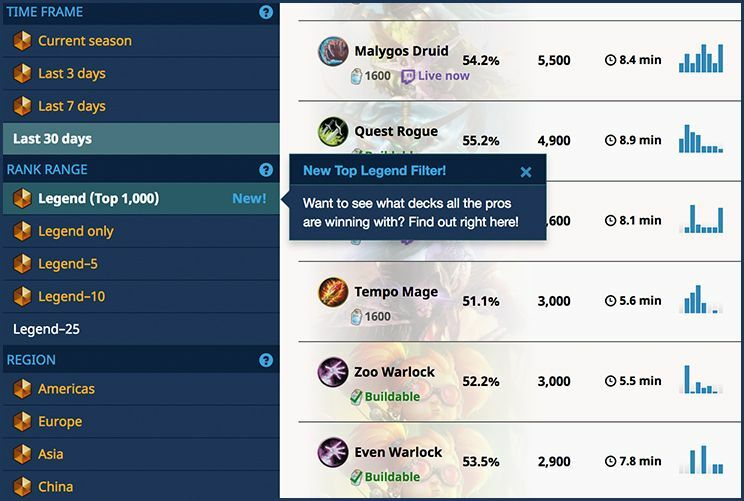 We decided to add the new filter as part of our continuous effort to offer the most accurate winrate and popularity for each deck, and we believe both pro and amateur players will be able to benefit from it on their quest for HCT points. Why use rank 1,000 as the cut-off point? This last point is especially important as many players might, understandably, want to test different decks and play less optimally once they've finally reached Legend, which in turn can skew the data. Not only that, but the meta itself can be quite different at various points of the Legend ladder. These variations can be the result of many factors including player skill, the meta around those ranks, and player familiarity with the archetype, among other things. We hope you're as excited as us about the new Top Legend filter. The feature is already available and can be found in the Rank Range section of the Decks Page, with support to additional pages following up in the future. Go check it out! Sign up for Premium to have access to the Top Legend filter and the full breadth of stats from HSReplay.net, including mulligan guides, personal statistics and more. Don't forget to follow us on Twitter and Facebook for daily Hearthstone stats! The HSReplay.net team is proud to announce the release of a brand new filter: Player Experience!